I personally love the Olive Garden Zuppa Toscana. This sausage and potato soup is one that I crave often. 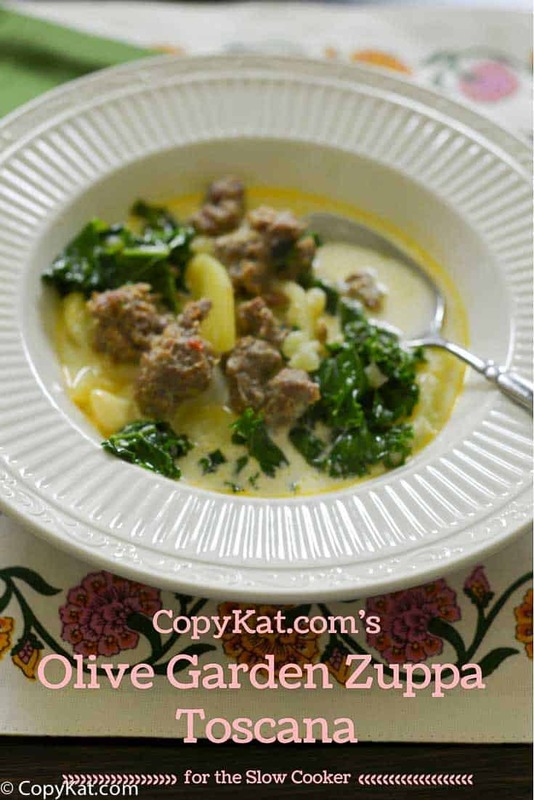 Many of you have wanted the Olive Garden Zuppa Toscana Slow Cooker version, so I want to make sure you have the recipe you want. So here we go. Sometimes we all want a recipe we can quickly toss in our slow cooker, and get about our business. This version of my Olive Garden Zuppa Toscana is easy to put together, so you don’t have to stand at the stove, you can go do other things while this soup finishes cooking. We are going to brown to meats in this soup before we put it in the slow cooker. I think this helps to eliminate the excess fat from the sausage and you will get a better flavor by browning these ingredients ahead of time. Now I have to say that the Olive Garden has changed their recipe from when I originally did this recipe almost 20 years ago. They have removed bacon from the ingredients. I haven’t found a bit of bacon in there in awhile. I do go back and recheck recipes from time to time to make sure they haven’t changed. I personally like the bacon in there, the smokiness of the bacon adds a very nice touch. So if you want to make it super authentic leave it out. They also used to use sausage links, but they now use sausage not in links. I even have a recipe you might want to try, I can show you how to make homemade Italian sausage if you like. We are going to add in the half and half (which is half heavy cream and half whole milk) and the kale about 30 minutes to even an hour before serving. You don’t want to overcook the kale, and the dairy, in my opinion, tastes best when added later in the process. Now you can serve this up with your favorite salad and breadsticks and have an enjoyable dinner for all. Drop me a comment down below of copycat recipe you want to see slow cooker style. I’d love to hear what you want. 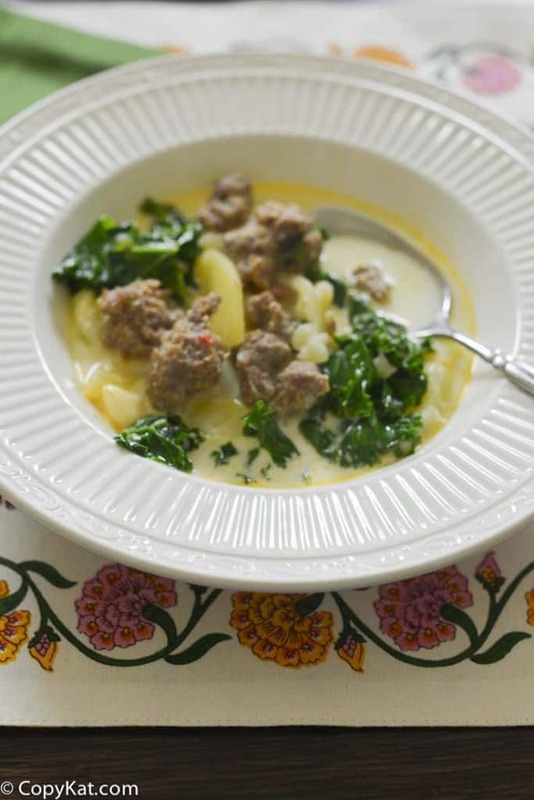 Make the famous Olive Garden Zuppa Toscana in your slow cooker. In a large skillet over medium heat brown together the sausage and bacon. Drain off excess fat and place into a slow cooker. Add sliced potato, onions, chicken broth, and cook on low for approximately 3 to 3 1/2 hours.Add chopped kale and heavy cream or half and half about 30 to 60 minutes before serving. Being on a sodium restricted diet but still loving food, I make all my own broths and make my own Italian sausage with only the sodium from the fresh meat. My chicken(or turkey) broth has about 30 mgs per cup. Everything is a trade off, so cream has no sodium while skim milk does. I use cream. These changes do not negatively effect the flavor, but knock down the sodium to less than 50 mgs per cup. I do not know how large your serving is but I picked a cup as a standard serving. I really enjoyed this soup at Olive Garden but couldn’t eat it there because of the sodium. I hope someone finds this useful.. Thanks so much for this recipe. This was awesome and I made it in my own kitchen! Takes the worry out of restaurant unknowns; cleanliness, freshness, etc. I take Cumin so can’t eat dark vegetables. What would you suggest in place of Kale? I would just omit it. Truth be told, this is one of the few ways I will eat kale. Don’t forget chopped garlic to the sausage browning! Italian anything is more Italian when garlic is added. I love Olive Garden Pasta E Fagioli! Would love to learn how to make that in the InstantPot! Great Recipe. The soup was fabulous. The only thing I did different was to add flour and butter. I made a paste and then added it to the soup. Added some extra kale as we relly like it. Will definitely make this again. Thanks so much. You mentioned that Olive Garden has changed their recipe for Zuppa Toscana. When Olive Garden first started having this soup, if I remember correctly, it was thick and creamy like potato soup. I hadn’t had it in many years, and when I had it recently it was runny, almost thin in consistency. Am I correct, that it used to be very thick? I think it used to be a little thicker. It certainly is thinker now. How to make this thick now I would make a roux and add the roux in while you make it, or you can thicken it later with a paste of equal parts of flour and butter. I would try about 3 tablespoons flour and butter, I think this would be a good start on thickening up the soup. I would like the recipe for Mark’s Feed Stores bergoo if possible. Thank you for your suggestion. I am not familiar with this restaurant. Where is Mark’s Feed Store located? I love to use instant potatoes for a thickener in my soups-adds even more taste. Can you get a copycat recipe for Popeye’s mild chicken. Also the gravy for so their potatoes? The closest I’ve ever come to the Popeye’s grave is the Tony’s Chachere cajun gravy mix. I want to see how to make IHOP Hash Browns please. Thank you! It’s back. I am sorry, sometimes these disappear for no reason. I would love to see the recipe for the , Olive Garden’s wedding soup and also for the mixed grillers with the sauce they serve with it. It’s to die for. I haven’t seen their wedding soup served. I think they have regional menu items. What area of the states are you located in? Just how I make mine! Using any other greens has not worked for me. Thank you so much for sharing and caring. I really like the kale for this. Monterey Steak Seasoning and red pepper flakes to taste. Also, collards will do if you don’t have kale. They are in same family. I love making this soup I usually triple the recipe so we have it to take to work for lunches for a few days! I eat soup all year long! This looks incredible! Nothing better than a slow cooker soup on a cold, busy day! I think you are so correct on that one! What is your favorite soup from the olive garden? You know what I need a good healthy breakfast bread pudding dish. Any ideas? Years ago I learned to make a healthy bread pudding as a breakfast. 4 small to med. apples, peeled, cored and diced. 2 tsp. cinnamon or spice of your liking. Pour over your cubed bread, add apples and stir in well. Perhaps top with nutmeg if desired and dot with butter. brown and puffy. Just don’t overbake and dry it out.